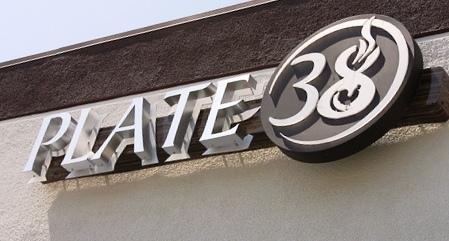 I had the occasion to be in Pasadena to accompany fellow gastronaut to Plate 38 to sample that establishment's well-reviewed burger. Parking was a snap in the attached lot. We waited for only a moment to be seated, ordered a couple of Classic Burgers, and settled in for about a 10-minute wait. We also had the opportunity to speak at length with Chef/Owner Robert Humphreys. Chef Humphreys' enthusiasm for his business was refreshing. 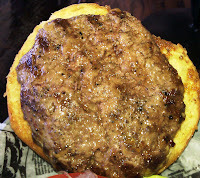 The Beef: Damn, that was some tasty burger meat. Plate 38 took regular delivery of Top Sirloin and Filet Mignon from Premiere Meat Company. Plate 38 cut in some of their own dry-aged trimmings to round out the beef. 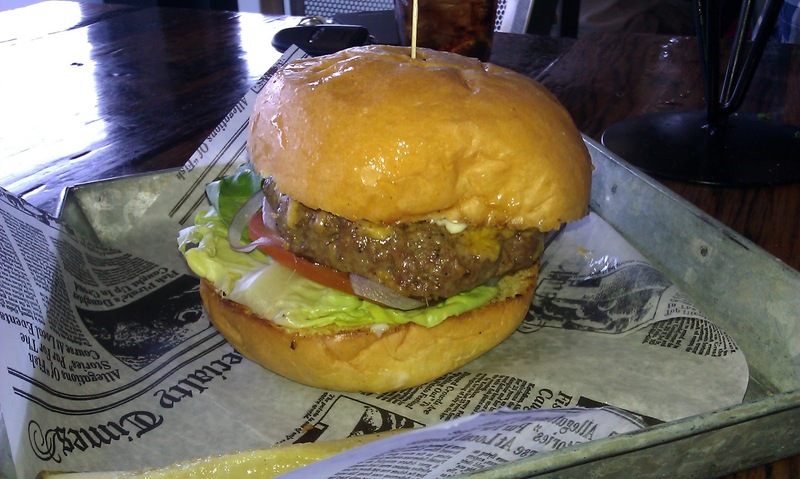 The fat content was right around 25%, but the burger was not overly greasy. The fat really seemed to stand out, because Filet is a dense, lean cut with little room to hold fat at a Medium Rare cooking temperature. The burgers were very juicy, and this was most satisfying. The patties carried strong and deep flavors of beef, and funk. Also present were firm notes of blood and minerals. The grind was coarse and the bite was just firm enough to hold together on the bun. The Seasoning: The kitchen at Plate 38 applied the perfect amount of salt to the exterior of the burger patties. This seasoning perfectly complemented the sear and the beef. The Sear: The sear was moderate, but Plate 38 provided just enough. The grill was properly hot, but but beef was so juicy that getting the surface of the patty up to the 300 plus degrees to trigger the Malliard Reaction would have been impossible without drying out the beef. 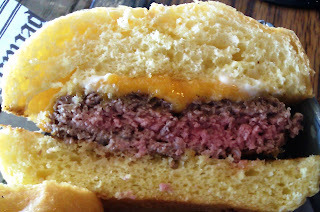 The edges of the burger patties were crisp and seared, and since the burgers were small (1/3 pound), nearly every bite had some tasty sear in it. The Preparation: The burgers at Plate 38 were formed by hand, and a portion of the beef was ground in house. The patties were formed gently, and this made them tender rather than chewy....Win! The Cheese: Plate 38 used a sharp and finely shredded Cheddar. This worked surprisingly well. Cheddar tends to be rubbery and it can be difficult to melt evenly. The shredded, aged Cheddar was rich with umami, salt, tanginess, and iron. Beyond the sturdy flavor profile, the cheese melted evenly and became creamy. 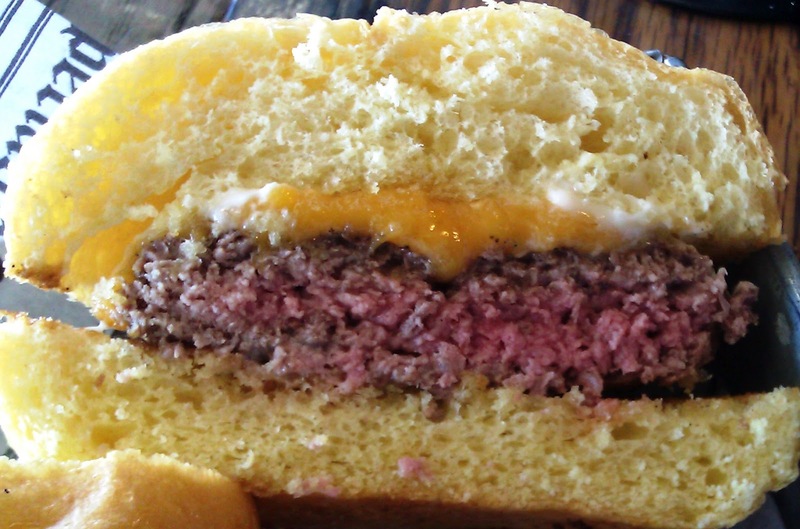 The Bun: The Brioche bun was sourced from Melrose Baking Company. The bun fresh, buttery, sweet, yeasty, and toasted to a proper crunch. The Meat To Bun Ratio: This was perfect. The crispness of the tender bun perfectly complemented the juicy beef. 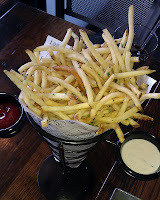 The Fries: The hand-cut, shoestring fries were plentiful, properly seasoned, and perfectly crisp. 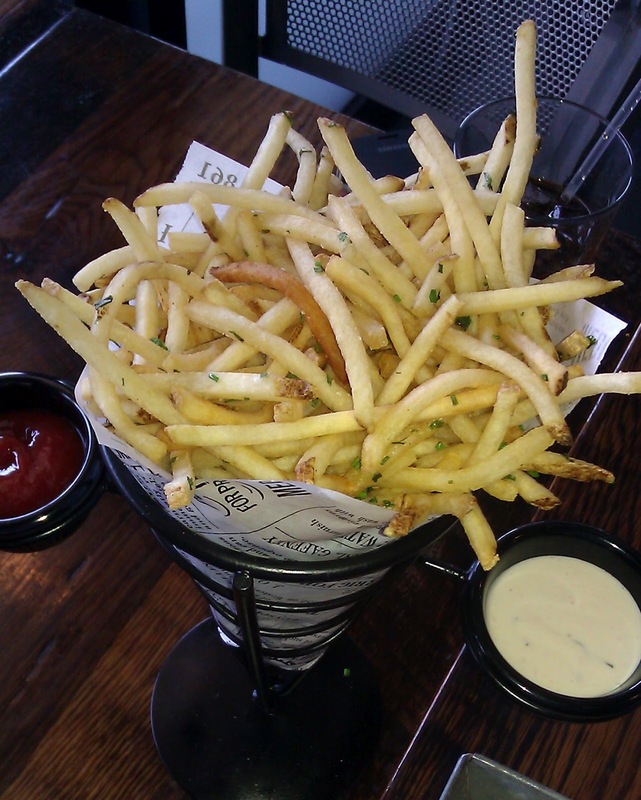 The fries were a winner. The Toppings: The Butter Leaf lettuce and the tomato were both fresh and ripe. The Value: At $8.50 a pop, the 1/3 pound burgers may have seemed a little pricey, but the quality of the ingredients and stellar preparation balanced this out. All told, the value was good. Chef Humpheys' kitchen at Plate 38 turned out a very strong burger. A monster sear from a grape seed oiled flat top or a smoldering cast-iron pan would have resulted in near perfection. Still, the cheeseburger was really, really good. Burger Review : When in Pasadena, Plate 38 is the spot for a burger. Go, and go soon.